Sustainable food systems represent one of the greatest development challenges of the coming decade, especially in the face of climate change. 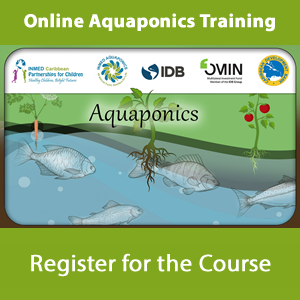 To confront that challenge, INMED has adopted an innovative food production technique known as aquaponics, combining aquaculture (fish farming) with hydroponics (soilless crop production). INMED experts have modified the technique to use “off the shelf” local materials, making it inexpensive and therefore more accessible to poor families and communities. Aquaponic systems are roughly 10 times as productive as equivalently sized plots that are traditionally cultivated, and protect both the quantity and quality of water resources by requiring no chemical fertilizers or pesticides and utilizing 85-90% less water than traditional irrigation techniques. 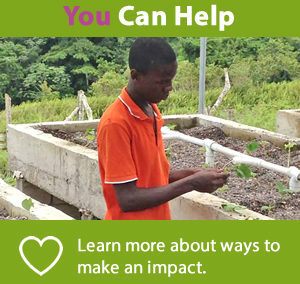 The aquaponic tanks produce tilapia, a hardy, fast-growing and widely consumed fish, and nutritious fresh vegetables, fruits and herbs that provide for food security among families, schools and agricultural cooperatives while also bringing premium prices for favored produce at local markets, hotels and restaurants. A single low-maintenance tank and grow-bed system can meet the nutritional needs of a family of four, plus additional fish and produce that can be sold to generate household income. But the promise of aquaponics is seen most quickly and clearly on a commercial scale. INMED’s simplified modular design allows farmers to scale up their systems as income allows, with a strong return on investment. 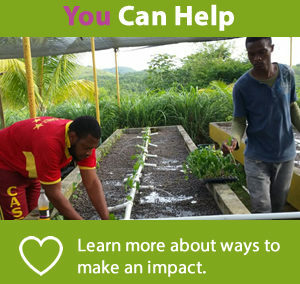 Want to get involved in aquaponics in Jamaica? INMED Caribbean was officially incorporated in Jamaica in 2010, but INMED Partnerships for Children has maintained a presence in Jamaica since 2002, working to improve the health, education, safety and opportunities of the nation’s most vulnerable children through adaptive agriculture, school gardening, climate change adaptation, nutrition education, positive youth development and teacher training programs.